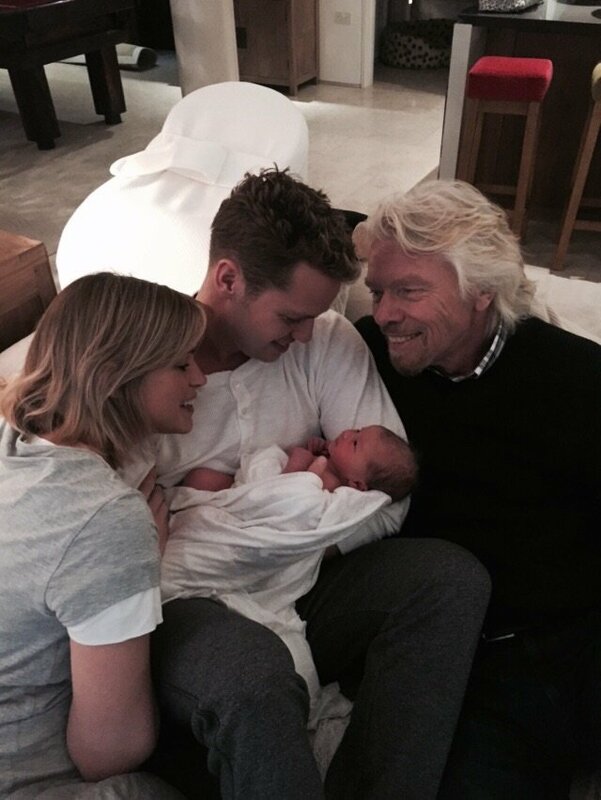 Delighted to share the wonderful news that Isabella and Sam are the proud parents of a new baby girl: Eva-Deia Branson. She was born at 4.39pm on February 19th, weighing 7.14oz. Joan and I are the luckiest grandparents alive to have three beautiful healthy grandkids in the space of two months, and Bellie’s parents Mary Gaye and Jo are equally ecstatic. I was in the British Virgin Islands and had an instinct to catch the plane back to London, although the baby could have arrived any time in the next week. Joan and I were lucky enough to get to the hospital before the birth, and within a few hours of my landing, Eva-Deia arrived. It was a magical moment watching Bellie and Sam welcome their child into the world; I’ve never seen them look happier and Sam was jumping for joy. They decided to name the baby after Sam’s grandmother Eve, and one of the most beautiful villages in the world, Deia in Majorca. We spent many happy times there as a family at our little hotel La Residencia, and funnily enough Holly also loved the name before deciding upon the equally beautiful Etta and Artie. Perfect names for perfect babies! Very soon the proud parents were able to bring Eva-Deia home to meet her cousins, Holly and Freddie’s twins Etta and Artie. I popped to the shop for some baby gifts with Etta and Artie in tow; then we spent a glorious Sunday afternoon together as a family with all three babies. It marked the start of a new life for us all. My uncle Charlie quoted Mark Twain when sending his congratulations to Sam and Bellie: “The two most important days in your life are the day you are born and the day you find out why.” I couldn’t have put it better myself.